In this world of dragons and castles, Thinkroll characters rule the realm with whimsy, logic, and science. Thinkrolls: Kings & Queens is one of the best new kids' apps in 2016! Dragons, Castles, and Moats, Oh My! Thinkrolls: Kings & Queens is an engaging logic app for kids that presents over 200 puzzles, playable in two levels of difficulty. 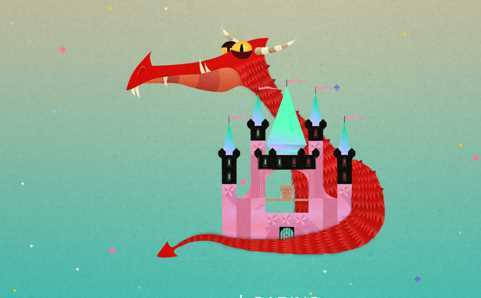 The app entices kids to visit six castles filled with rooms that are logic puzzles. To work through a castle, the player starts in the rooms near the top of the castle and then rolls through the 17-20 rooms to reach the bottom. 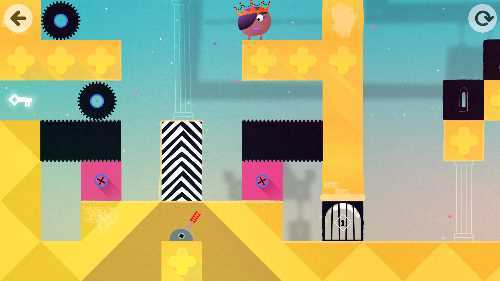 In each room, the player directs a ball-shaped character through a maze-like puzzle that requires moving of objects and activating of devices. The goal of each puzzle is to clear a path for the roly-poly character to obtain a door key for the next room, and then roll through that unlocked door into the next room/puzzle. Each castle is protected by a sleeping dragon. Kids will discover lots of gems and sweets to collect as they explore the castle's nooks and crannies. 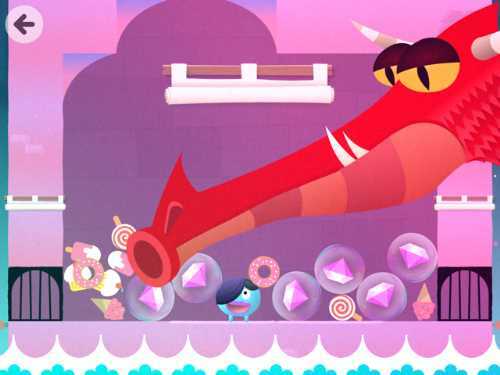 After the last puzzle in a castle, the dragon awakes and gleefully exchanges your collected loot of candies, ice creams, and such for accessories to dress up your characters. Each of the six castles has its own architectural style, background music, and science concept to teach. In Castle 1, kids will solve the maze-like puzzle by combining gears with racks so that doors ratchet open to reveal pathways or conveyor belts. These gear-based contraptions can be activated by an on/off switch. Castle 2's theme is about positioning moveable square crates to fill in gaps so the rolling character isn't hindered. The crates are so heavy that they can break suspension bridges. In Castle 3, players discover hilarious crocodiles lurking inside small moats. When the crocs open their mouths, the ball character can't pass by; so solving the puzzle involves bringing a magic harp to the reptile to sing it to asleep. Spookiness abounds in Castle 4, which is filled with cute little ghosts who won't move until you shine a light on them. 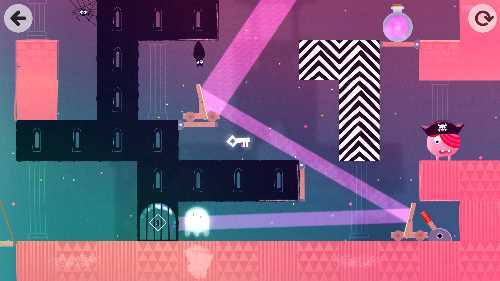 Each puzzle has a movable mirror and a light source, so that players can reflect the light onto the ghost by positioning the mirror. Castle 5 introduces hatches and switches. The key to solving these puzzles is to figure out when to activate the switch to raise or lower the hatches. The sixth Castle is filled with magic potion bottles. When you drop one off of a ledge, the bottle bursts and out seeps a temporary buoyancy spell which will lift up a character, crate, mirror contraption, harp, or other object as needed. The key to solving these puzzles is to figure out how to break the bottles so that the gravity-defying potion lands on the object or character that is in need of a temporary lift. A good logic app for kids creates a sequenced curriculum where the puzzles get progressively harder. Thinkrolls: Kings & Queens does this brilliantly. At each Castle, the logic builds on what you know, to get more challenging. 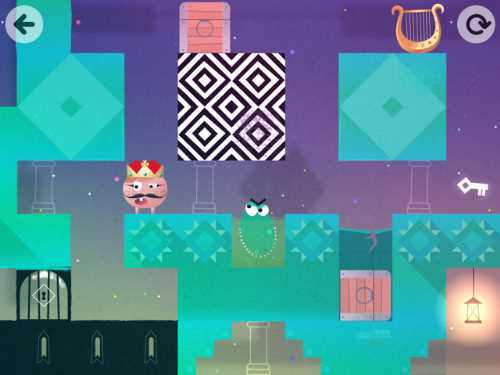 The app also takes the problem solving learned in the earlier Castles, and applies it differently in the later Castles. Plus the app has 115 puzzles that are "Easy" for ages 5 to 8, and another 113 that are "Hard" for ages 8 and up. The adding of science concepts -- such as simple machines, forces, tension, light reflection, and more -- to the puzzles adds to this app's already top-notch educational impact. But it is the Thinkrolls characters that really steal this show. Kids can start each Castle by designing their own boisterous, diverse Thinkroll. Players choose the skin tone or a design such as a zebra. Then they can change some of the facial features and add all sorts of fun accessories, from wild hairdos to star-shaped glasses to crazy hats and visors. The Thinkrolls can be made to look like kings, queens, knight, animals, mummies, and so much more. Each Thinkroll makes gibberish sounds, moves its eyes, and forms expressions using its mouth. They even make their eyes whirl when dropped from too high of a height. The charm that is found in the Thinkroll characters spills over into the other characters found in the castles. Bats can be tapped to make them fly away and spiders spin silk to soar away when touched. The crocodiles in the moats are famous for their hilarious one-eye eyebrow lift while watching you. And the ghosts are so cute when they quietly say "Boo" that you just want to hug them. Thinkrolls: Kings & Queens is spectacular to look at as well. Each castle has a unique architectural design. Kids will hear different accompanying music in each of the castles. Since Thinkrolls: Kings & Queens does a fabulous job of introducing children to logic, science, and problem-solving in an engaging manner, it is perfect for any family with kids ages 5-12. With two levels of difficulty and profiles for up to six different players, Thinkrolls: Kings & Queens is an app that all family members will enjoy. Parents, join in on this one, because it is such a pleasure to explore. This is the third app in the Thinkrolls series, and while the first two also earned our top 5-star rating, this is our favorite so far. You don't need to have played the first two apps (Thinkrolls and Thinkrolls 2) to enjoy this one, since it stands on its own. But if you haven't experienced the first two, you will want to, after playing this one. 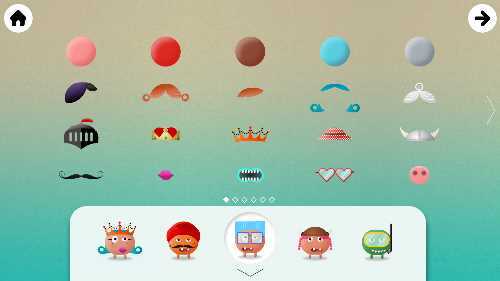 This Thinkrolls: Kings & Queens app review was written by Jinny Gudmundsen.